Tony Bellew has vowed to "once again prove the whole world wrong" when he challenges Oleksandr Usyk for the undisputed world cruiserweight title. 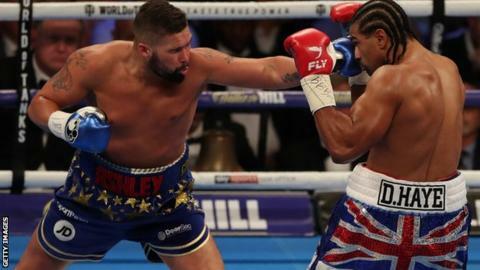 Bellew, 35, steps down a division after two heavyweight wins over David Haye to face Usyk in Manchester on 10 November. Usyk, 31, became the first to hold all four world cruiserweight titles - WBO, WBC, WBA and IBF - when he won the inaugural World Boxing Super Series. "He'll see someone that will never give in, ever," Bellew told Radio 5 live. Bellew has lost only two of his 33 bouts, the most recent defeat coming in December 2013 against Canada's Adonis Stevenson. Asked about facing unbeaten southpaw Usyk at the Manchester Arena, he admitted: "He is one of the most feared men in boxing. This is the ultimate test for me." He added: "I'm taking this with my eyes wide open, I know I'm facing the best cruiserweight in the world, the best since Evander Holyfield in my opinion, an amazing fighter who can do everything and I'm happy to go in there against him and once again prove the whole world wrong. "He's a monster they all say I can't beat but it's not my first time at the rodeo. I've heard it all before. Let's just see if he can answer all the questions I've had to answer throughout my career. "What I can promise is I will not be in awe of this man. I will not allow him to rattle five-, six-, seven-punch combinations. He will see someone that will never give in, ever. "I've fought people far quicker, far more powerful. What I haven't fought is someone who puts all the things together as good as he does. He can't show me something I haven't seen before. "The world says I can't beat him, can I outbox him? Probably not. Can I chin him? Absolutely. I'm the quickest cruiserweight he has ever fought and when I hit him he's going to know I am the hardest cruiserweight he has ever fought. "There ain't a man I've ever shared a ring with who hasn't felt the same thing 'how in God's name has that skinny fat freak just hit me so hard'. And he's going to feel the same." Ukraine's Usyk won the WBO title in his 10th fight before adding the WBC with victory over Mairis Briedis in the World Boxing Super Series semi-final. He added the IBF and WBA crowns by beating Murat Gassiev in the final. "I've been preparing for this fight for a long time and I'm delighted that we've got the venue and the date finalised," said the 2012 Olympic gold medallist. "I cannot wait to fight in the UK."